Health benefits are an important tool for attracting and retaining high quality talent. This is true for start-ups and small businesses, as well as Fortune 500 companies. And yet, while nearly all (99 percent) of large employers offer employees health insurance, only half (54 percent) of small and medium-sized businesses offer coverage today (Kaiser/HRET 2015). It’s not that small companies don’t value investing in health benefits - most do. Rather, continual cost increases and restrictive eligibility requirements create significant barriers for offering or keeping coverage. So, where does that leave us today? As small companies explore ways to offer affordable and flexible benefits, one popular solution is to reimburse premiums, instead of paying them. 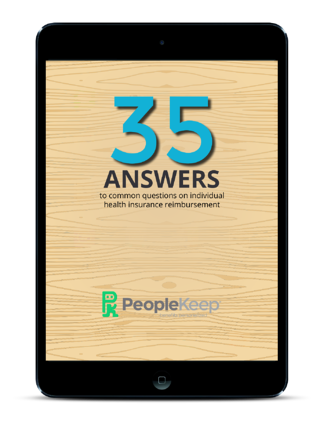 In a newly released whitepaper, Zane Benefits provides 35 Answers to Common Questions on Individual Health Insurance Reimbursement. This method of providing health benefits to employees is quickly becoming a preferred alternative to expensive and rigid group policies that take a one-size-fits-all approach to coverage. Readers of the paper will find practical help with navigating the 2016 open enrollment period and useful tips for using individual health insurance to offer healthier employee health benefits. New whitepaper seeks to answer the most commonly asked questions about health insurance reimbursement, as an alternative to traditional small group insurance plans.